DO-08612-30 was succesfully added to your cart. These compact valves are built for maximum durability and robust performance in the toughest applications, and are 100% helium leak-tested to 1 x 104 mL/s for guaranteed performance and reliability. They are available in brass, electroless nickel-plated steel, and electropolished 316 stainless steel. The body-to-bonnet, metal-to-metal seal is designed to significantly increase the pressure range of the valve without compromising the flow, and help maintain the integrity of the bonnet threads by segregating them from the process media. 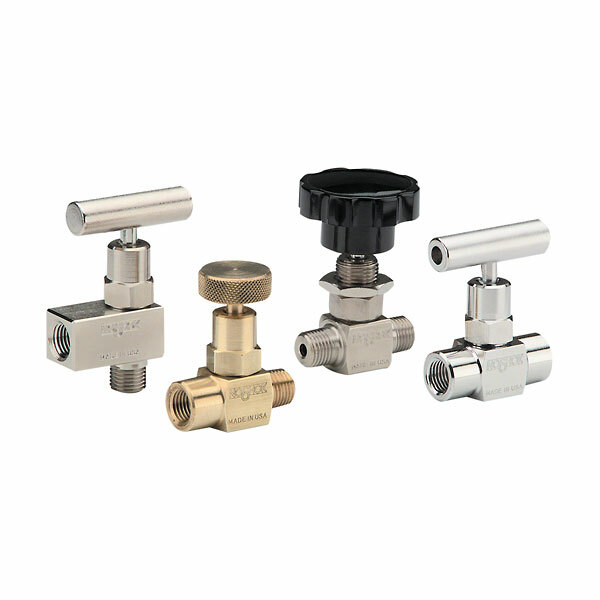 The 100 Series hard-seat valves have a maximum pressure of 10,000 psi for stainless steel and steel models; 6000 psi for brass. The 150 Series soft-tip valves feature a unique Delrin® acetal nonrotating soft tip stem, a backup metal-to-metal seal, and have a maximum pressure of 6000 psi for stainless steel and steel models; 3000 psi for brass.